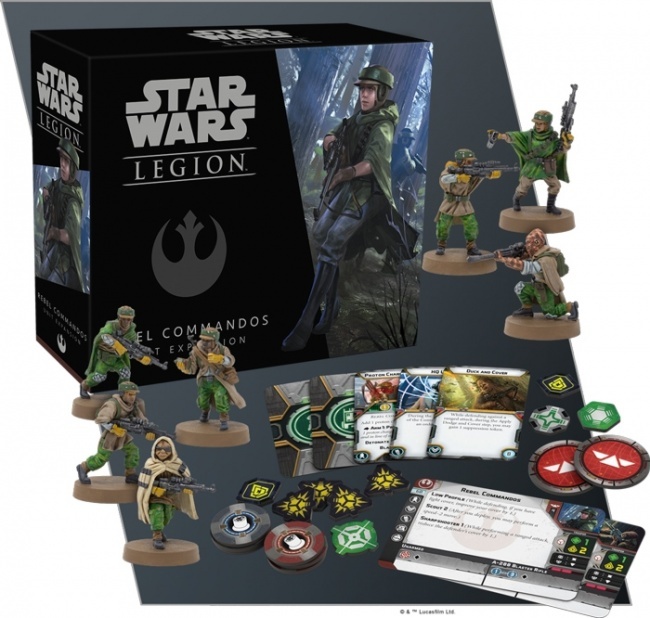 The next pair of expansions for Fantasy Flight Games’ Star Wars: Legion tabletop miniatures game, the Han Solo Commander Expansion and the Rebel Commandos Unit Expansion will hit the battlefield in Q3. The third leader for the Rebels, the Han Solo Commander Expansion offers new army-building options for Rebel players. 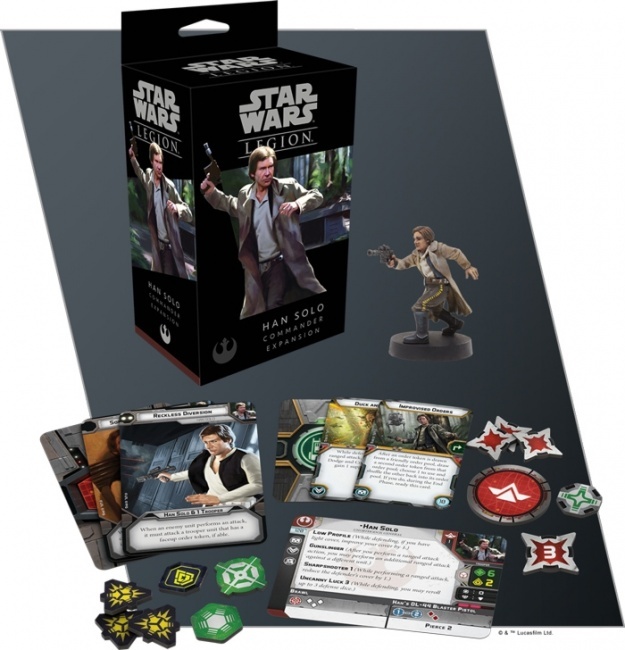 The expansion has a single unpainted miniature depicting the galaxy’s most famous scoundrel, plus three upgrade cards and three command cards to reproduce his unorthodox leadership style and quick-shooting skills in the game. All the tokens needed to add Han Solo to the game are also included. The Rebel Commandos Unit Expansion offers Rebel players even more options for designing their strategy. Skilled at infiltration, espionage, and sabotage, the Rebel Commandos are the first “special forces” unit introduced to the game. 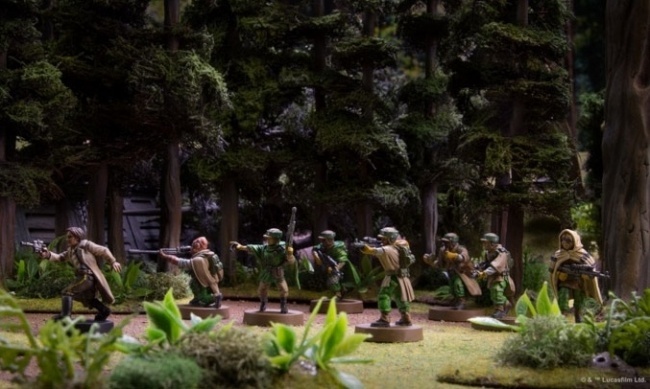 More flexible than other units, Rebel Commandos can be fielded as full 5-man teams or deployed in groups as small as two operatives, and can be armed with powerful sniper blasters or explosive Proton Charges, depending on their mission. This set comes with 7 unpainted miniatures, 2 unit cards, 5 upgrade cards, and the tokens needed for this unit. MSRP is $24.95. See the gallery below for images of the components from both expansions. The base game for Star Wars: Legions just released (see “Preview: ‘Star Wars: Legion’”), along with a host of expansions (see “First Unit Expansion for ‘Star Wars: Legion,’” “Imperial Snowtroopers Deploy for ‘Star Wars: Legion,’” “Rebel Reinforcements Arrive for ‘Star Wars: Legion,’” and “Two Terrain Packs for ‘Star Wars: Legion’”). FFG will support the game with a new OP program (see “‘Star Wars: Legion’ Organized Play”).